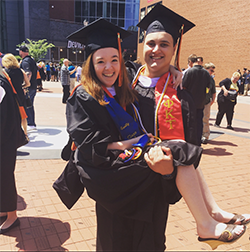 Lauren Breheney '14 and Levi Bartow met at William Paterson University in 2006 during a Greek Week function. They started dating the following semester and got married Oct. 29, 2016 (two days after their anniversary). Darcell Medley-Stokes '04 and Jamal Stokes '04 met in the fall of 2000 in the student center, in front of the Sbarro pizza shop. They have been attached at the hip ever since. 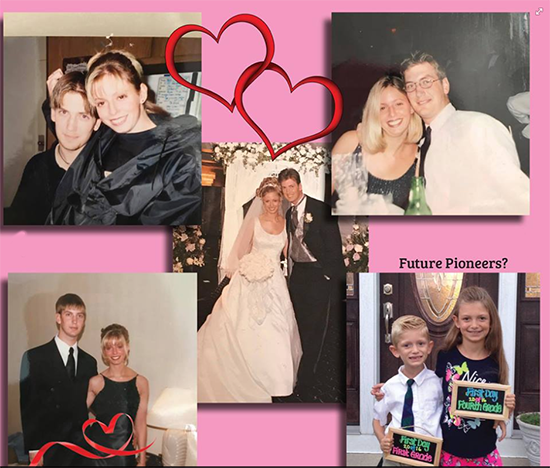 They graduated together on May 18, 2004 and were engaged Dec. 24, 2004. 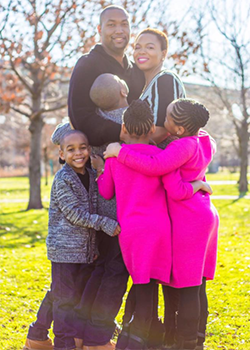 They got married on May 26, 2007 and are the parents to four children: Bryce, 11; Jewel and Jayla, 9; and Braylon, 6. "Willy P will always hold a special place in our hearts because of our relationship and the beautiful people we met and remain in contact with," Darcell says. John DeRitter '13 met Ashley Herman '13 in Professor Cook's history class in September 2011. They were both history/education majors, both became teachers after graduation, and just so happen to work in the same school district now. 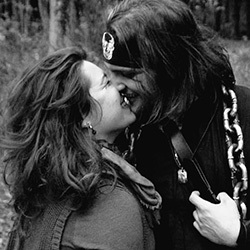 John and Ashley were recently engaged and are looking forward to the next chapter of their lives together. Marianna Del Monaco Cornelison '06 met Matt Cornelison '05 in the spring of 2004 at Wayne Hall, through mutual friends. They were engaged Dec. 31, 2010 and were married July 15, 2011. 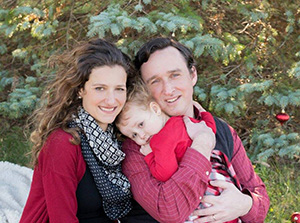 They welcomed their first child, Matthew Jr., this past July. "We love Willy P. and always look back on our time there fondly," Marianna says. 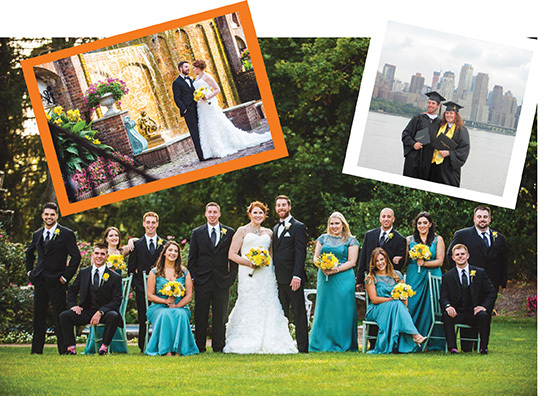 Beth Cohn Gartland '08 and her husband Patrick Gartland '08 went to high school together but didn't start dating until their senior year at William Paterson. They were married in 2013. 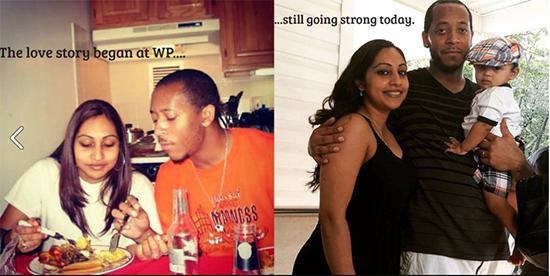 AnJaya (Richardson-Evans) Penannt '07 and her husband Anthony Pennant '06 began their journey at William Paterson as friends, having met at Capers on a Thursday night. Eleven years and two baby boys later, they agree that their life changed forever on that night when AnJaya added her number in Anthony's "Sidekick" cell phone. Emily Bruno '16 met Eddie Baldofsky '16 during Common Hour. Both were in Greek life and found they really got along. They began dating a few months later and have been together for almost four years. "I have so may memories with him and have WPU to thank for that," Emily says. Steve Irvin Holmes II '09 and Saima (Hussain) Holmes '10 met on campus, became best friends, and were always spotted together. As Steve describes it, theirs is "One of the best love stories ever lived ... we truly understand the cliche 'falling in love'... the feeling can easily be compared to falling -- not knowing what to do, mixed range of emotions, unexpected -- but the reward of landing in love with that one person makes for a strong and trusting start of a relationship." 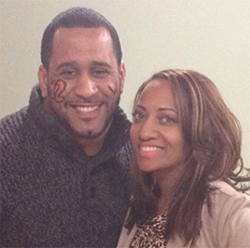 Christina and Emanuel Capers never actually spoke when they were students at William Paterson about a decade ago. They both lived in Hillside and their social circles intersected, but they only saw each other on campus in passing. At a Christmas party four years later, they finally spoke, and the rest is history. Emanuel is pictured here wearing his #42 that he wore on the Pioneers football team. Linda Gallenger Kish '90 and husband Dave Kish '89 met at an ice cream social during orientation in September 1986. They started dating on July 25, 1987. They were married 5 years later, on July 25, 1992, and have two sons, ages 19 and 17. Linda and Dave will celebrate their 25th wedding anniversary this July! 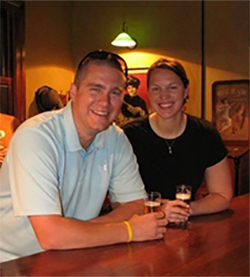 Diane Jansson '07 and her husband Paul Jansson '06 met on campus on Diane's first day as a freshman (Paul was a junior). They were both members of Alpha Phi Omega. 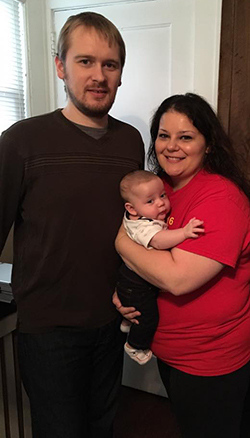 They were married in 2010 and had their first child Liliana in 2015. Christina (Oliveira) Hayes '12 and Mark Hayes '12 met at a sorority/fraternity interest event and then met up again at a New Year's Eve party. They talked all night and have been together ever since. They dated for eight years before getting married Sept. 4, 2015 with a bridal party consisting of five University alums. 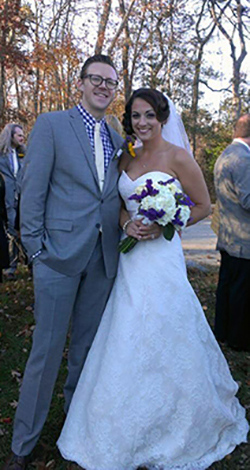 Barrie Kate Foley '07 and Brad Foley '06 met on the campus basketball courts. Barrie was a member of the women's basketball team, and Brad was a student athletic trainer. Carol Greene-Lobban '83 and Robert Lobban '79 met at a local pub 40 years ago, when she was a cheerleader for William Paterson College and he was a basketball player. They talked all night and started dating Nov. 11, 1977. 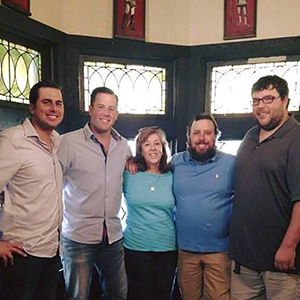 They were married three years later and have four sons together, one who attended William Paterson and played on the baseball team. 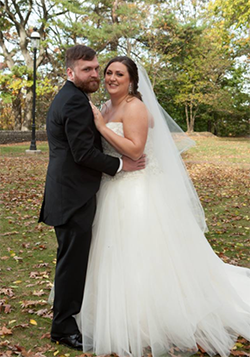 Alex Oras '09 and Samantha Neil '09 met at William Paterson University 10 years ago this spring. They are getting married in April, almost 10 years to the day they met. Their bridal party is full of University alums. Samantha is currently an adjunct professor on campus, in the Women's and Gender Studies department. Jennifer Sinclair Ringler '05 and Allan Ringler '06 met on the first day of the fall semester in 2001, during the club fair. Jennifer was a sophomore and an editor for "The Beacon" newspaper on campus. Allan was an incoming freshman. While Jennifer worked the newspaper's table at the club fair, Allan approached and signed up to join the staff. He eventually became a writer for Jennifer's section of the paper, the two became fast friends, and in February of 2002, they had their first official date: dinner at Wayne Hall. They were married July 2, 2010. 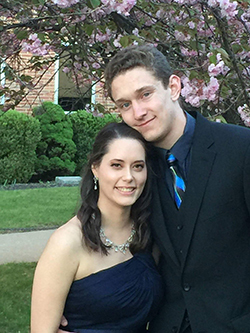 Alexandra "Lexie" Metzler '16 met Brandon Gessner '17 met last Valentine's Day. Lexie and friends left their dorm room after being reprimanded by the Resident Assistant a few times for being too loud while playing Yahtzee with Brandon's roommates (Brandon was at work at the time and had never met Lexie). The Yahtzee game moved to Brandon's apartment instead, and when he arrived from work and met Lexie, they hit it off right away. They went on their first date the very next day. Chris Merkel '98 and Alicia Rosenberg Merkel met in October of 1995. He was president of his fraternity, TKE and Alicia was friends with many of the people from the Alpha Sigma Tau sorority, with which he had a close working relationship. Lindsey Calem-Jutkowitz, an AST, introduced them and they started dating on Oct. 13, 1995. Chris and Alicia were married May 27, 2001 and they have two children. 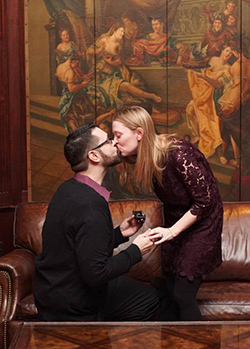 Danielle Trupia '16 and Patrick Walsh '16 are engaged to be married. 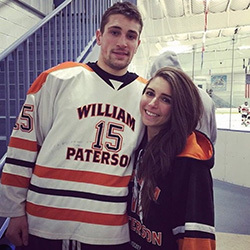 They met at a classmates's off-campus abode, loved hanging out at Underdog and attending University ice hockey games. 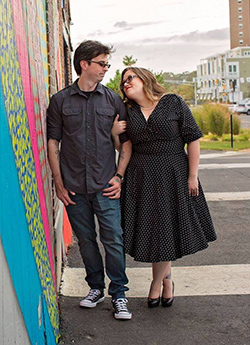 The couple plans to wed sometime next year in Boston, where they currently reside. Kate Baxley '15 met Bryan Huth '16 while taking Filmmaking II in Hobart Hall in the spring of 2014. They didn't speak to each other much, but the following semester, in Filmmaking III, a conversation about internships led to Kate and Bryan becoming instant friends. 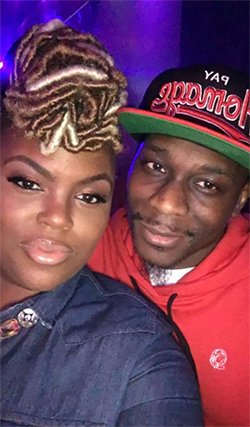 She graduated soon after, while he continued pursuing his undergraduate degree, and although the two tried to remain friends, distance and life got in the way. However, in September 2015, Kate was accepted into William Paterson's MBA program with a job as graduate assistant in the University's communication department. Kate and Bryan saw each other on the first day of the semester and picked up right where they had left off. A couple weeks later, they started dating.